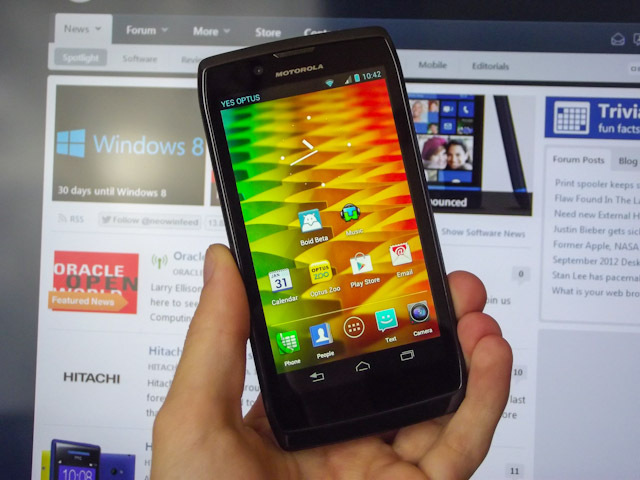 Late last year, Motorola released the amazingly slim Droid RAZR to praise from the community and reviewers alike. At the time, its TI OMAP dual-core processor and 4.3-inch screen were the markers of a flagship Android smartphone, and despite launching with an outdated operating system it sold well on carriers such as Verizon. Now we're almost a year from the announcement of the original RAZR Android device, and Motorola has come out with a refresh of the smartphone known as the Motorola RAZR V. It's an interesting device that slots into the now-mid-range of Motorola's line-up, and is curiously replacing the standard RAZR on Australian carrier Optus, despite having few major differences. That said, the RAZR V is sold at a reduced price compared to the RAZR - but are the few trade-offs and differences worth it? We'll I guess you'll have to read on. Almost every aspect of the RAZR V remains identical to the RAZR: there's a 1.2 GHz dual-core TI OMAP chipset inside, an 8-megapixel rear camera capable of 1080p video, a 4.3-inch qHD display, near identical weight and the same OS after updates are factored in. Below are the specifications of the Motorola RAZR V alongside the Motorola RAZR so you can see how similar the devices are. I've highlighted a few advantages here that the older RAZR has over the RAZR V, and the one that stood out as the most strange to me was the RAZR is thinner by 1.3mm but still manages to have effectively the same size battery. Does the switch to a TFT LCD panel really increase the space by all that much? 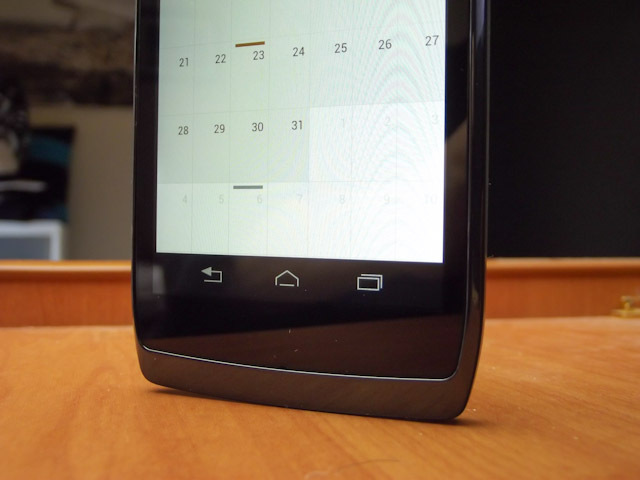 If you've seen Motorola's previous designs for Android devices you know what's in store for this device. 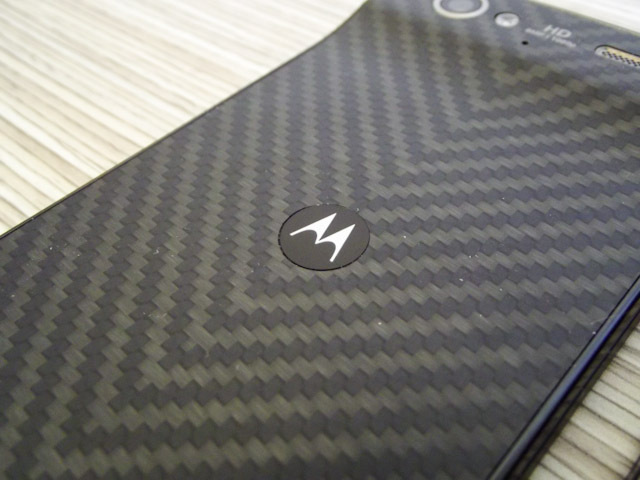 It has a number of features that are now an iconic part of Motorola's designs, including the tapered square front, tough Kevlar exterior and the hump which dates right back to the Motorola Droid X. As this device is so similar to the Motorola RAZR, naturally I'll be making a few comparisons from time to time. Compared to the older device, the RAZR V has a smaller profile, which negates the complaint with the RAZR that the bezel was too wide; the RAZR V is comfortable to hold and it's noticeably easier to use the touchscreen because of the reduced width. The RAZR V is also a fraction shorter than the original RAZR, which is more appropriate for accommodating the 4.3-inch display. Unlike the RAZR, the RAZR V comes without a row of capacitive buttons below the display, instead using Android 4.0's onscreen buttons. Normally this would be all well and good, except that there is virtually no reduction in the bezel below the screen, leaving a large slab of blank glass just sitting there. This makes for a double-whammy: the effective screen real estate is decreased because of the on-screen buttons, however the physical profile hasn't seen any compromise. Due to this, there have been countless occasions where I have gone to hit the home button, but landed my finger way below where it actually is because I was anticipating the buttons would be further down. Don't think too much of it though, because normally the 4.3-inch display is quite accessible and easy to use. You'll have more issues trying to press the power button on the top of the device, which was strangely reallocated from the side of the original RAZR. The power button is quite flush with the top of the device, which also sees the microUSB charging port and 3.5mm audio jack, and it's also angled away from your finger which makes it sometimes harder to hit than necessary, even after weeks of use. In contrast, the volume rocker on the right hand side is easy to hit and very sturdy. The only other standout feature around the edges of the device is a little flap on the bottom left that conceals the full-sized SIM card slot and the microUSB expansion slot. The RAZR V has only 4 GB of internal storage, of which just over 2 GB is available to the user, so you'll almost certainly be wanting to expand this. 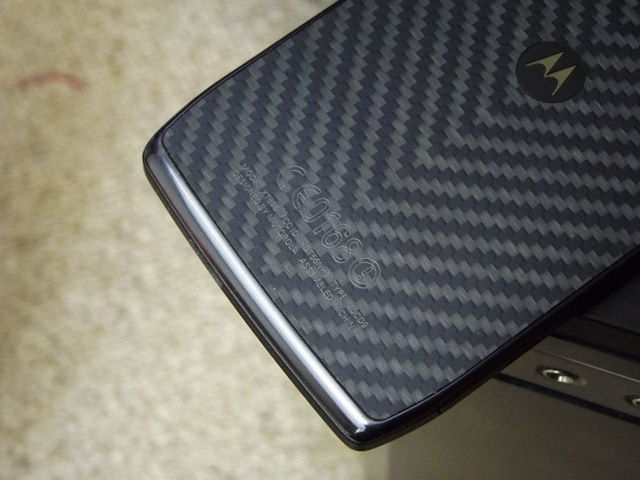 The back of the RAZR V features edge-to-edge Kevlar, which feels simply incredible on a smartphone and is naturally going to be one of the toughest materials out there. The Kevlar goes right up and onto the iconic Motorola hump, surrounding the camera module to the left and the speaker to the right (exactly the same positions as the RAZR). 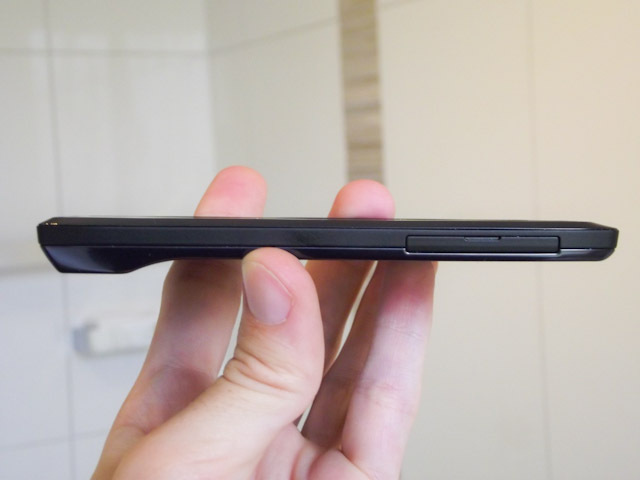 As I mentioned in the specifications section above, the RAZR V is a full 1.3mm thicker than the RAZR, which is a disappointment as it loses pretty much all of the slim appeal that the RAZR had. 8.4mm is pretty thin for a device, but the fact that it has a hump roughly 12.5mm thick makes it look a little bit chubby. 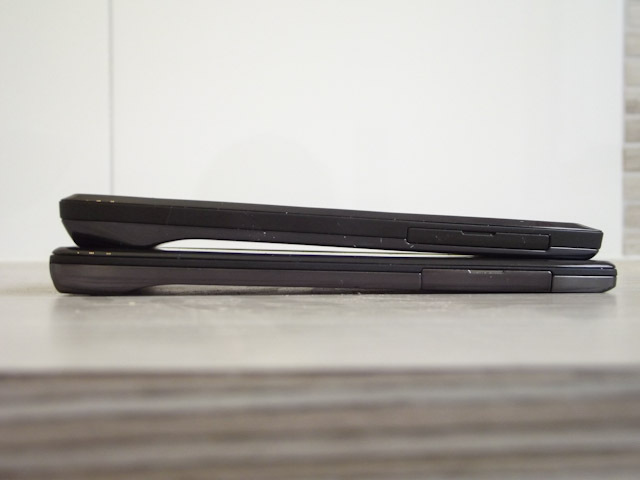 The RAZR and its 11mm hump is vertically smaller than the RAZR V's, which helps hide the fat right up the top and keep the rest beautifully slim. You can't say the same for the RAZR V.
The RAZR V's design doesn't stray too far from the original RAZR, but there have been some obvious compromises made that makes the end result not as great. For me, the power button was a definite issue, and although the Kevlar is nice and the design is ergonomic, I can't help feel as though the RAZR V is a chubby friend of the slim RAZR. For the RAZR V, Motorola has opted to go with a 4.3-inch 960 x 540 (qHD) TN TFT LCD panel, a display which they are naming "ColorBoost". As soon as you take the device out of the box and turn it on you'll be greeted with a swab of colors on the homescreen, meant to show off the ColorBoost display in the best light. Obviously the TN panel used here is on the lower end of the scale, as higher-end devices often choose to make use of IPS displays which deliver a better range of colors with higher contrast and better viewing angles. This particular TN panel is not nearly as bad as the old generation panels we all hated using on devices like the Motorola Defy, but it's not as good as current Super AMOLED and IPS LCD displays. Compared to the Super AMOLED Advanced display in use on the Motorola RAZR, the ColorBoost display on the RAZR V produces colors that tend to be lighter and with less contrast. 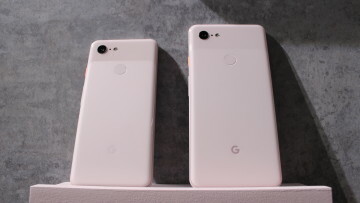 The difference in vibrancy is noticeable when comparing the two side-by-side, with the AMOLED coming out as the obvious victor in this department as well. The TN panel is not awful, but there is room for improvement in what color range it has despite Motorola claiming it's better than the iPhone 4S (it isn't). I can say, though, that the RGB stripe subpixel arrangement in use on all LCD panels is a noticeable improvement over similar-sized AMOLEDs that use the notorious PenTile matrix. The RAZR V is much crisper than the standard RAZR with its PenTile display, despite both screens using the same resolution. Where the PenTile matrix often gives the edges of icons and text small red dots, there is no such effect on the LCD panel and you'll find it quite crisp. Again, comparing to the equivalent Super AMOLED, the RAZR V's LCD panel is brighter and therefore easier to see outdoors. White levels are also much better as you don't get the cold tint of the AMOLED, but it falls behind in black levels. The RAZR V's display is better than the poor quality panels you'll find in low-end Android devices, but it does little to convince me that it's worth the ColorBoost branding or anything above just an average display. 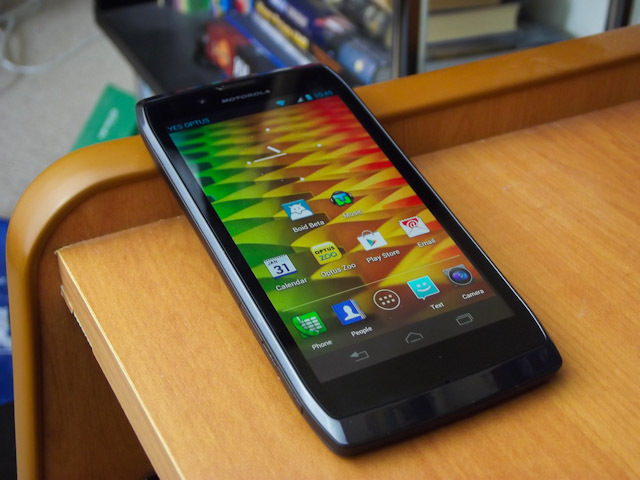 One of the best features of the Motorola RAZR V is the software, which surprisingly is very close to stock Android 4.0. Unfortunately this phone didn't launch with the latest version of Android on-board, Android 4.1 Jelly Bean, but we'll take what we can get with the virtually skin-free operating system. 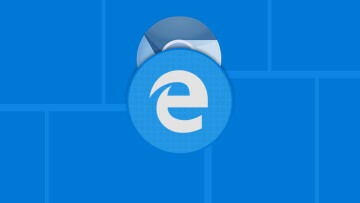 Gone are the days of Motorola slapping on the awful Motoblur/Blur skin on their devices. 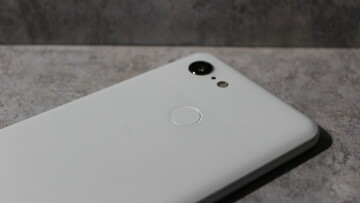 Perhaps the takeover by Google has seen the senses slapped into them, because the majority of this phone (and Motorola's future line-up) is exactly the same as what you'l find in stock Ice Cream Sandwich, which you can read all about in my review here. As I've mentioned previously, the RAZR V opts to use ICS' on-screen buttons as opposed to physical capacitive buttons below the display. This reduces the everyday screen real-estate from 4.3-inches to 4.0-inches, but you gain the added benefit of dynamic buttons, the Recent Apps button and the retained ICS style. 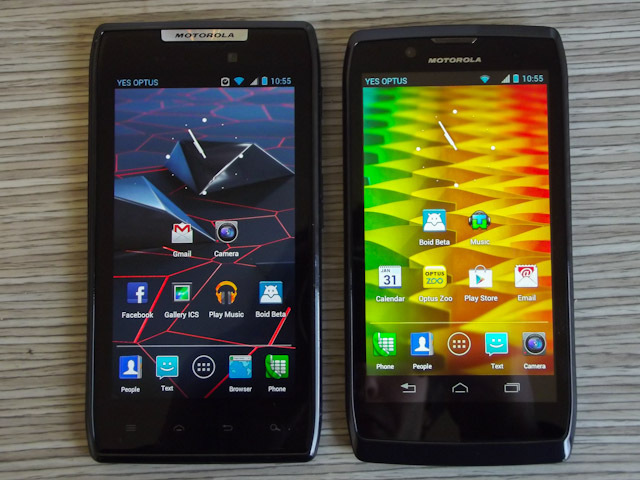 Going to the Droid RAZR, which has an identically sized 4.3-inch display, feels like a screen space upgrade, but for the size of the RAZR V I'm not too fussed about it. Across the board Motorola has changed a few things from ICS, such as the style of the icons, which is a puzzling change when they haven't actually changed the apps they represent. The lockscreen has been changed to use a Motorola design: a ring with four shortcuts on it (the right one being to unlock) - annoyingly it doesn't look like you can change the apps here from Camera, Messaging and the Dialer. The notification pane has been slightly modified to always show the carrier you're on, which in my opinion is completely useless as you should know which network's SIM card you've put in the device. A number of apps such as Contacts and Messaging also use a black background with white text, as opposed to the other way around in stock Android; the style remains the same as ICS though. 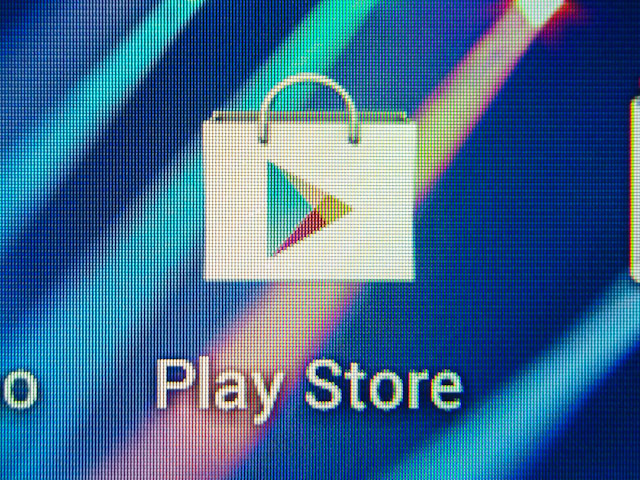 You'll be glad to know that the following apps remain essentially unchanged from stock Android: Alarm & Timer, Browser, Calculator, Calendar, Gallery, People, Text and Phone - plus the usual swab of unchangeable Google apps that are bundled with the device like Gmail and YouTube. 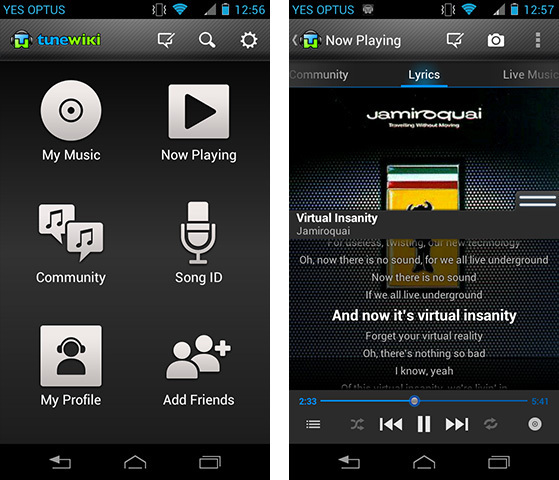 Rather than bundling Google Play Music, which currently isn't available here in Australia, Motorola have bundled in TuneWiki Pro (labelled as "Music") as the music player on the RAZR V. If you've ever used TuneWiki it's a very well featured music player, with the ability to pull extra information about your artists and songs from the internet, including scrolling lyrics which is a great addition. With TuneWiki, you do lose the notification pane controls, but the lockscreen buttons remain. 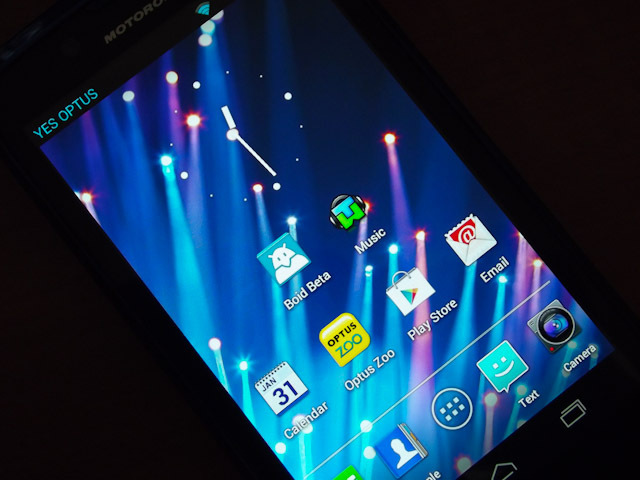 Smart Actions is perhaps the most outstanding addition to the Motorola RAZR V. It has been included on a couple of other Motorola devices so far, including the Droid RAZR, but it continues to be extremely useful on the RAZR V. Basically, Smart Actions is a program that allows you to set automatic actions to occur when certain triggers are met. 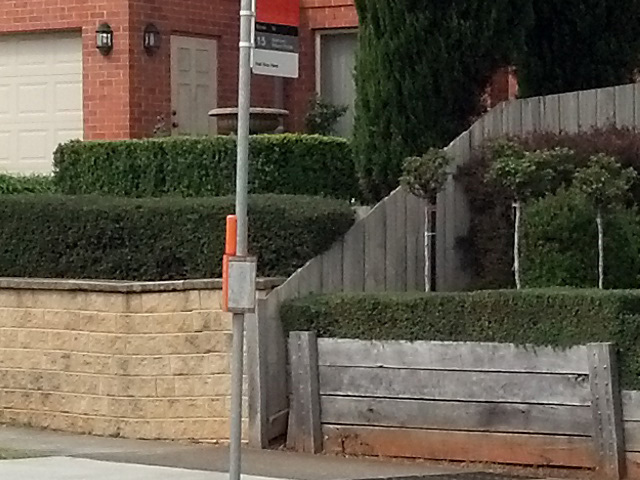 An example would be turning your phone automatically to silent when it detects you're at work through GPS location. 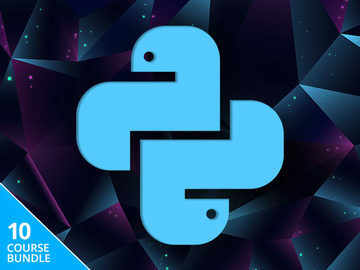 There are a huge number of triggers to choose from, and it's an extremely customizable app so there are heaps of options and things to configure to help automate actions you frequently do manually. One of the actions I love setting is automatically silencing the phone at night, when the phone is charging, enabling me to get a peaceful sleep without being interrupted by messages or emails. 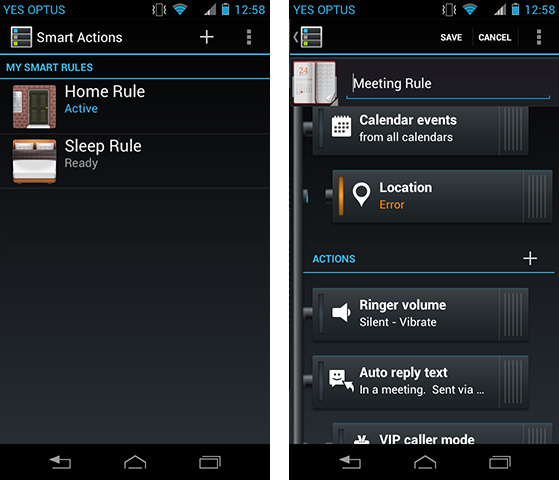 You can read more about Smart Actions on the Play Store, although it's restricted to Motorola devices only. 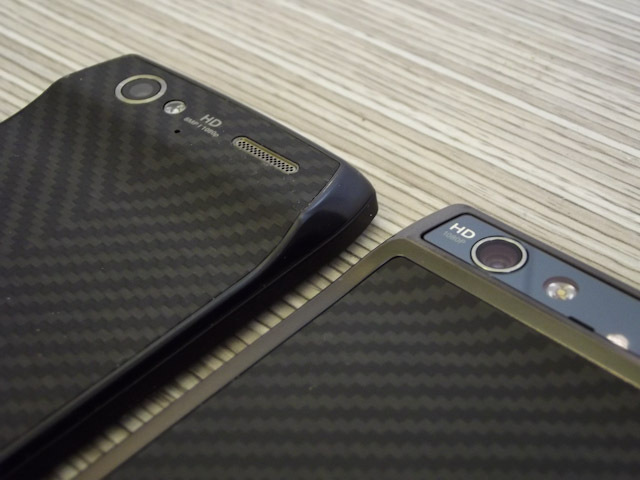 The Camera app is one of the few, perhaps the only application that has received a Motorola skin. Unfortunately, the skin looks atrocious compared to the rest of the great software, and has only basic functionality such as a few scene options, changing the flash and a few quality settings. 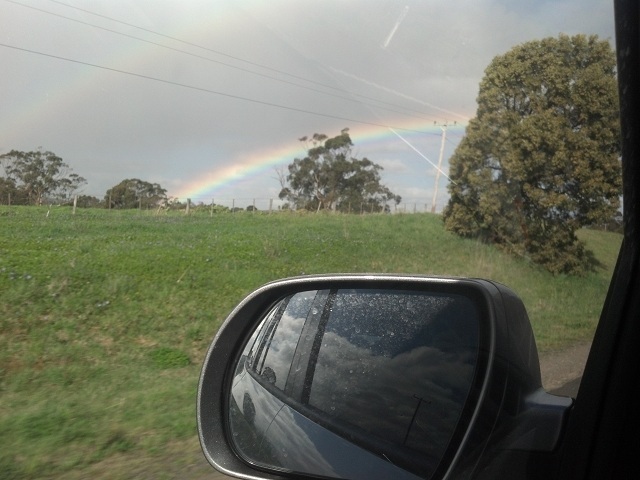 This isn't too much of a big deal, considering the camera isn't all that amazing as you'll see later on. 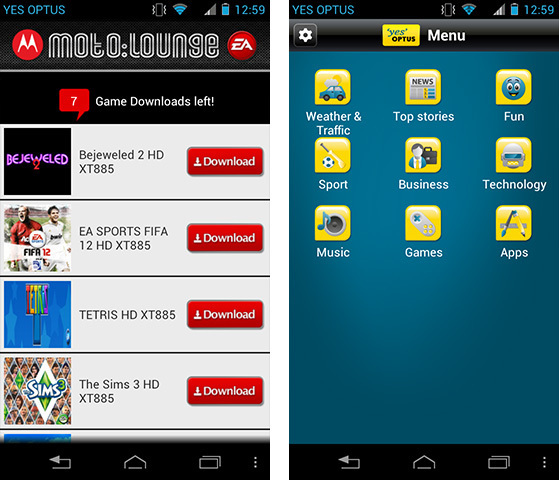 The MotoLounge app I usually would slam as it's basically just a web portal, but in this case I'll give it a pass as it does link you to a download to an app that lets you download (that's right, a few steps here) free EA Games apps. The apps aren't some of the best from EA like Dead Space but you can get The Sims 3, Bejeweled 2, NFS Hot Pursuit for free, among others. 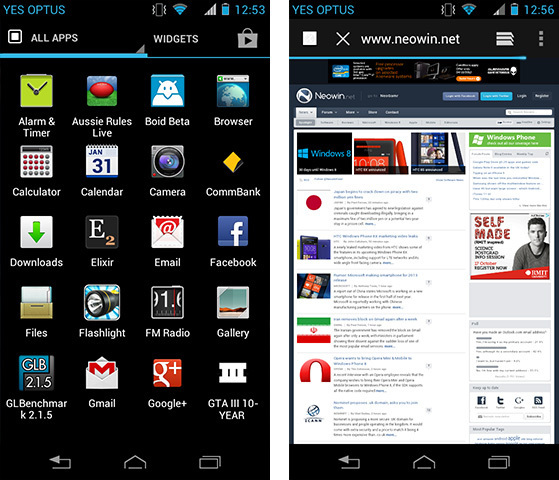 Unfortunately the last I have to mention is the large number of spam apps Optus has bundled with the smartphone. In my couple of weeks with the device I have had literally no reason to use any of the four Optus apps, two of which are portals and the other two are horrible excuses for Android apps. As the RAZR V is a mid-range device, you won't be seeing a quad-core chipset inside this smartphone. Instead, Motorola has opted to use essentially the same chipset as the Motorola RAZR: a TI OMAP 4 with a 1.2 GHz dual-core ARM Cortex-A9 CPU and PowerVR SGX540 GPU, accompanied by 1 GB of RAM. Despite this processor seeming a bit underpowered compared to the Tegra 3 and Exynos 4 Quad guns on the market at the moment, it still performs quite well for what you'll be wanting this phone to do. As I've mentioned the software is close to stock Android, and that paired with a decent enough processor means you won't be seeing lag really at any time, unless you're using the awful bundled Optus apps. Things that I use my smartphone for, like sending texts, browsing the web, checking Twitter and Facebook, sending emails and checking the weather, was no problem on the RAZR V. There was occasionally some slowdown as I multi-tasked and switched between apps, made easy thanks to the on-screen Recent Apps button, but apart from that I really had no complaints. 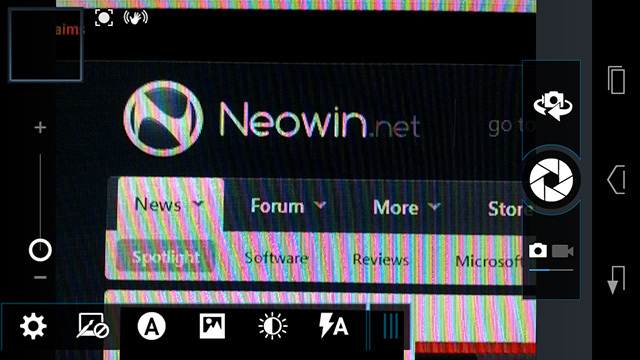 I found the browser often kept an enormous amount of background tabs "open", although the way the browser works means that this doesn't really affect the performance at all. 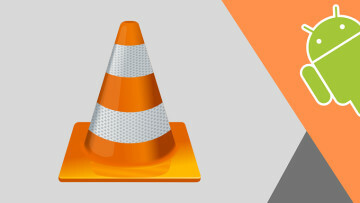 When browsing graphics-heavy websites such as The Verge, I was pleased to see the OMAP chipset was up to the task of scrolling quite well, although there was some slowdown when I zoomed in and out of the homepage. Graphics-wise the RAZR V uses a PowerVR SGX540 GPU, which is what I would now consider to be an aging GPU seeing as though it was part of the original Galaxy S' "Hummingbird" chipset. However, between the version seen in the Galaxy S and the RAZR V, clockspeeds have been increased so you will see better performance than the two-year-old device. What interested me was that the RAZR V seems to perform better in games than the RAZR despite both having essentially the same chipset. In Grand Theft Auto III with the settings turned up to maximum, the RAZR V seemed to push out more frames per second than its older counterpart, and I don't think I can fully attribute it to the slightly smaller screen area to render due to the onscreen buttons. 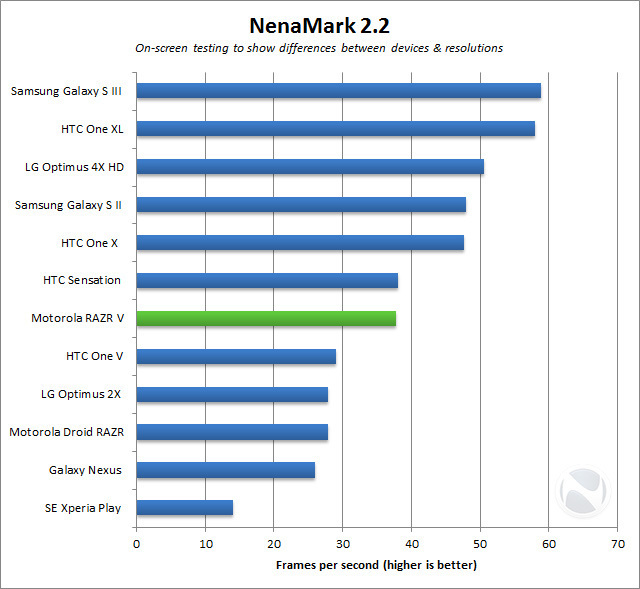 After I performed the benchmarks, which you can see below, it seems like the Motorola has upped the clockspeed of the PowerVR SGX540 to the same levels as the Galaxy Nexus - giving a notable performance boost over the RAZR at the same screen resolution. This suggests the chipset in the RAZR V is the TI OMAP4460 instead of the OMAP4430 in the RAZR, although I can't confirm that as there's no documentation; it's safe to say it's an OMAP 4 though. Anyway, in both devices GTA III is definitely playable, but you aren't going to see the same smoothness as the One X or Galaxy S III with significantly faster processors. You won't be disappointed with the gaming performance of the RAZR V, but then again you won't be blown away either. 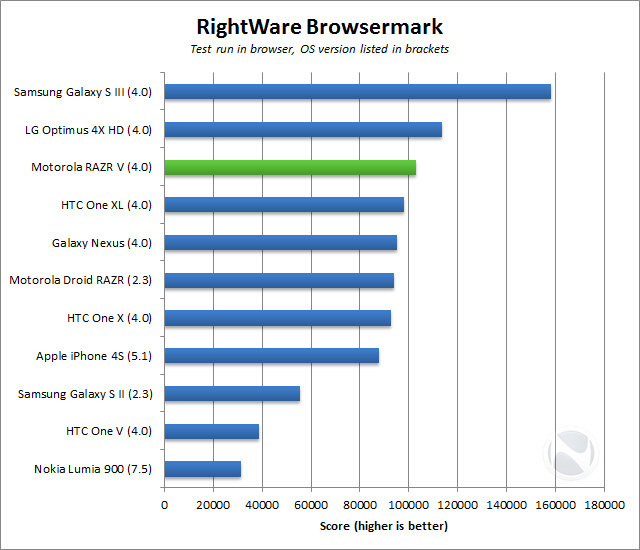 Here are the results of the five standard benchmarks I run on Android smartphones. Despite a new version of Vellamo being available, I will continue to test phones using Vellamo 1.0.6 until I change my benchmarks (probably next year). 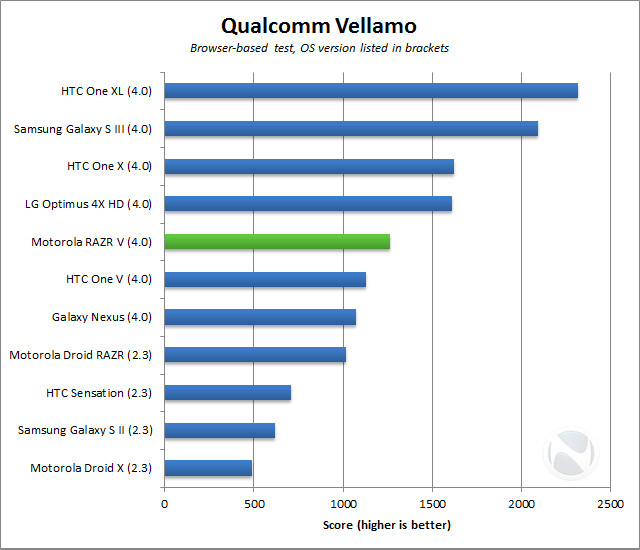 In both BrowserMark and Vellamo the Motorola RAZR V holds an edge over the Droid RAZR, and although both chipsets are clocked at the same 1.2 GHz and use the same core types, the difference can be attributed to the browser improvements going from Android 2.3 to Android 4.0. 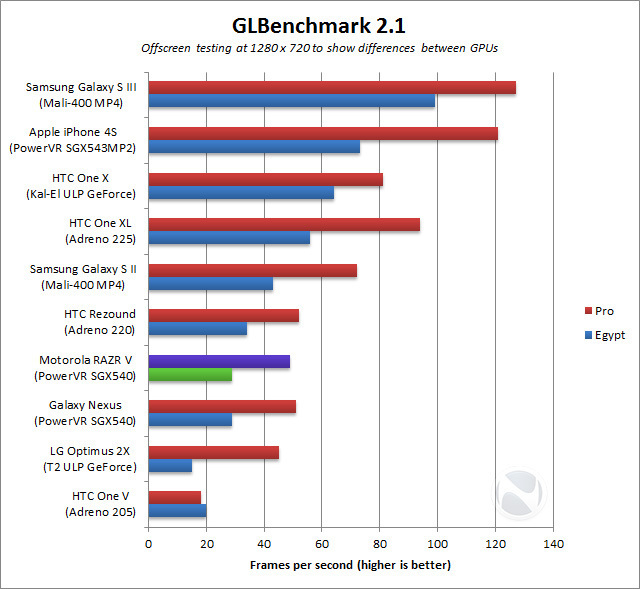 In the above graphics benchmarks you can see how the RAZR V has the same GPU as in the Galaxy Nexus, and how it has a performance advantage over the Droid RAZR at 540 x 960, which affirms my thoughts that an OMAP4460 chipset resides in the RAZR V.
Again, we have another similarity to the Motorola Droid RAZR. The RAZR V, which I am reviewing here, has essentially the same 8-megapixel rear camera as the RAZR, including an LED flash and 1080p video recording support. On the other hand, while the 1.3-megapixel front-facing camera looks the same on paper, it's only capable of VGA video recording and the quality is much worse (compared to the RAZR) as you'll see below. 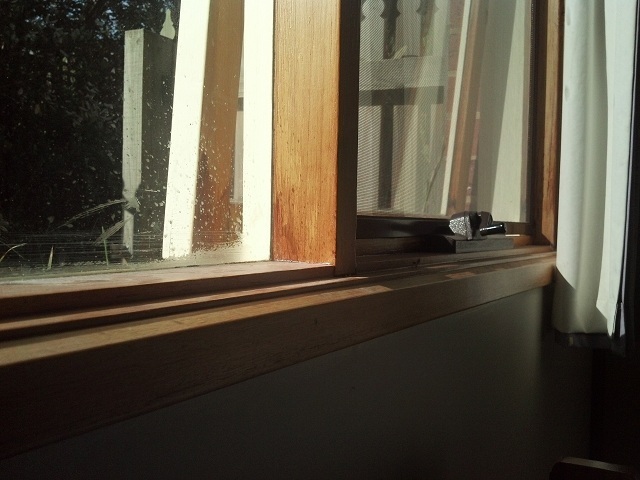 The Droid RAZR's rear camera was generally average, often performing poorly indoors and, until the ICS update, had dodgy autofocus. Luckily I had no trouble with the autofocus on the RAZR V, but the quality of the camera has definitely made the switch to this newer device. 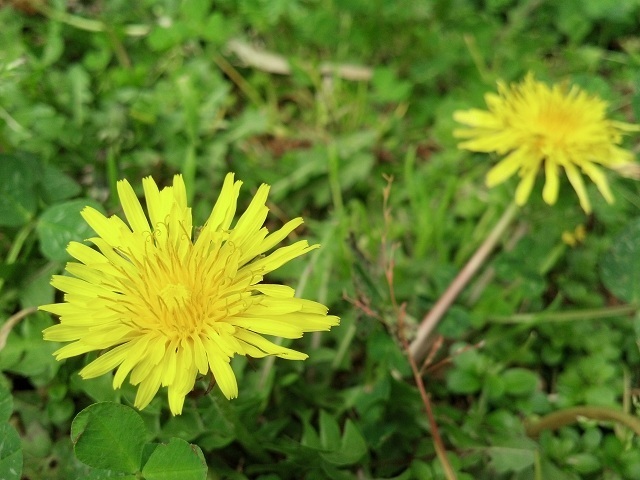 When it comes to color quality I was impressed with the ability of the RAZR V to reproduce greens and blues, as long as you have good outdoor lighting. For some reason reds weren't as vibrant as the other portions of the spectrum, and this is reflected when you look at wide shots involving brick houses. 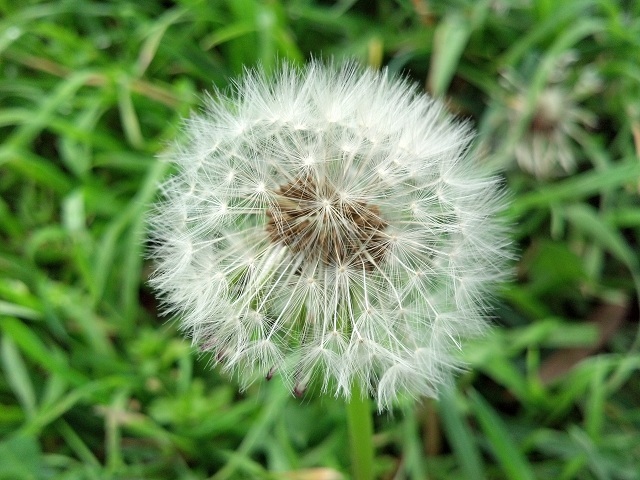 You can also tell from some of the shots above that the lens quality of the RAZR V is quite good, managing to deliver great depth-of-field and generally crisp lines - especially in the shot of the dandelion seed head, which I think is one of the best I took with the camera. In wide shots this sharpness decreases when you look at a 100% crop, but there is still a decent amount of detail for a smartphone camera. One thing I did notice with the RAZR V's camera is that shots pretty much across the board are less saturated than a real-life image (could your eyes capture it), and indoor shots are particularly washed out in comparison to those outdoors even when the lighting is not that much worse. With the RAZR V, you'll find it hard to reproduce the quality of outdoor shots when the lighting starts to drop off - even in cloudy weather. As with a lot of smartphone cameras, the dynamic range is also fairly mediocre, meaning shots that show both indoor scenes and windows can have significant areas of over- and under-exposure. 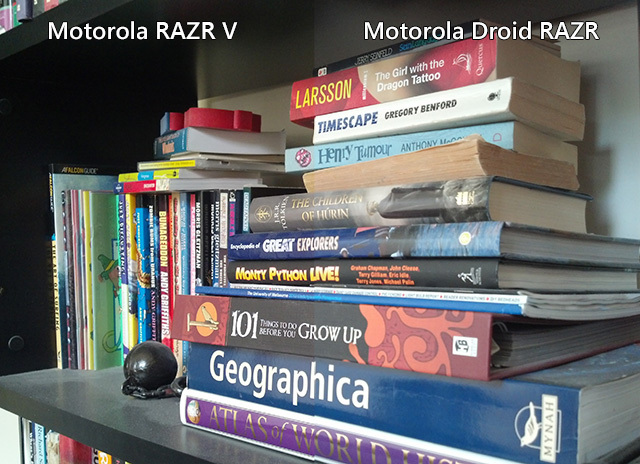 Below you can see a direct comparison of the camera in the RAZR V to the Droid RAZR. 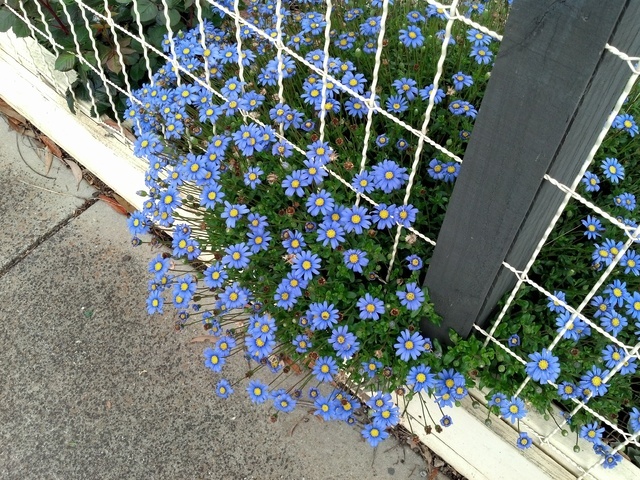 Although the image looks vastly better on the display of the RAZR V (due to artificial image processing in the software), when pulling the two photos onto a computer the two images are extremely similar, as expected as I believe both devices have the same camera. Contrast and color quality is pretty much indistinguishable between the smartphones, which suggests they both use the same sensor as expected. The RAZR V's image was slightly crisper, a product of properly fixed autofocus, and a slightly different exposure seems to have been used, but I doubt you could pick which camera took which had an unlabeled test been conducted. The flash on the RAZR V is poor, as is the case with most smartphones. It has a limited reach, making it only really useful for close-up shots in the dark, as you can see in the shot below. 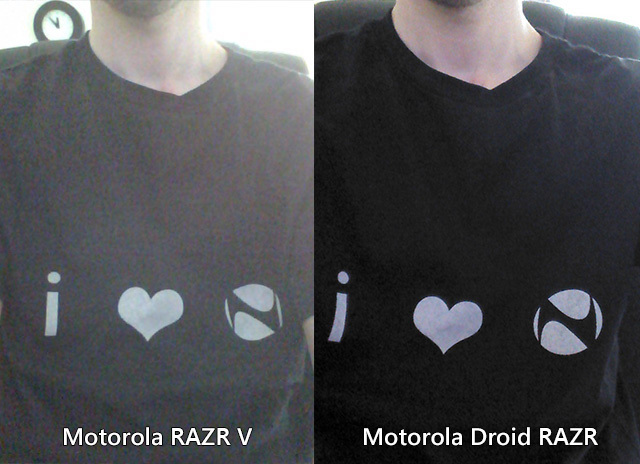 Also worthy of a mention is the difference between the Droid RAZR and RAZR V's front facing camera. 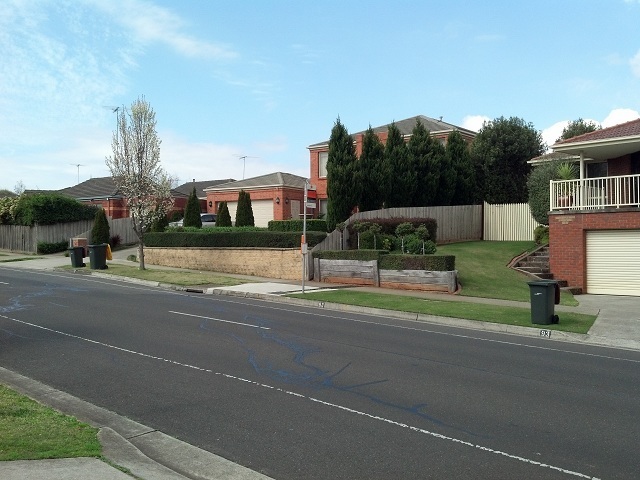 I mentioned at the start of the camera section that the 1.3-megapixel cameras are quite different, with the RAZR V's being notably worse as you can see in the comparison below. Considering the still shots of the RAZR V's camera are nothing special, I wasn't expecting too much in the video department. The rear camera can record at 1080p, and I was most impressed with quick autofocus and ISO changes, although nothing else was particularly mind-blowing about the recording. Check out the video I took below. 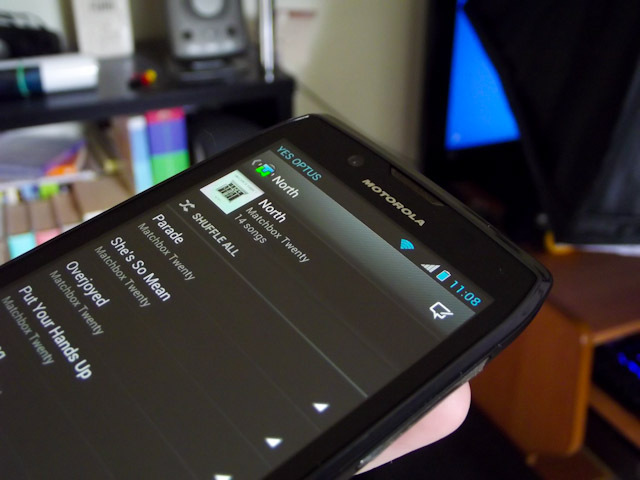 Media playback is another area that is identical to the Droid RAZR, thanks to exactly the same rear speakers and an identical media processing chip inside the smartphones. Quickly on the RAZR V's rear speaker, it's the usual appalling quality for music, but it gets the job done for ringtones and speakerphones, plus it's reasonably loud so you should be able to hear it when you need to. Moving on to the more important audio quality from the 3.5mm audio jack and I was initially surprised at how bad it sounded when I loaded up a song for the first time. Then I realized, after a good deal of searching for the sound settings, that "3D stereo" was enabled as a sound effect by default in the settings. Why Motorola has done this is beyond me because it seriously degrades the quality of sound, and I'm not sure how many end users would know how to disable it. 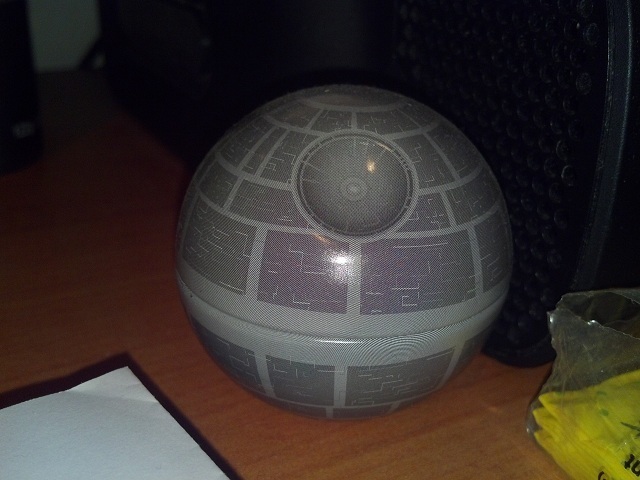 Anyway, after turning all sound effects off, I was greeted with the usual sound quality I'm used to from the Droid RAZR. It's nothing spectacular, but it gets the job done in a fashion that isn't poor either. One thing I did notice about both the RAZR V and Droid RAZR is that to achieve a comfortable listening volume, I needed to have it around 75% of the maximum, which means that if there's a particularly quiet song or video I'm watching, there's little room to boost the sound to make it audible. The 4.3-inch screen on this smartphone is nothing amazing for watching videos, but at least you do regain the extra screen real estate used for the on-screen buttons when watching videos. As I already mentioned in the display section, the screen can go quite bright so there should be no issue watching videos on the RAZR V. You should also be glad there's a microSD expansion slot as the 2 GB of user-accessible internal storage is not nearly enough for any real media consumption. Below are the results of my usual 7-part video playback test. Improvements to MX Player means that a lot of smartphones that previously couldn't play Amazing Life now can thanks to the Hardware Plus decoder. Admittedly it's not perfect, but it does allow playback to an extent. The same cannot be said for playback of TRON: Legacy with its 6-channel AAC audio; for whatever reason MX Player couldn't use the H/W+ decoder for this video, and was instead forced to use the somewhat laggy software decoder. The playback here is quite alright so long as you don't have any 6-channel audio files, as MP4 and AVI playback up to 1080p works smoothly when it only has to decode two channels. When it comes to mid-range devices there is an expectation that, due to the internals not being a performance powerhouse, the device is going to last a decent amount of time on one charge. 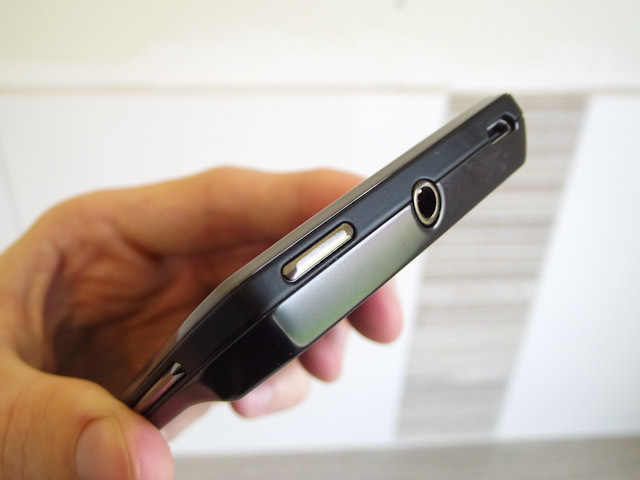 It's even more critical when the phone in question, like the Motorola RAZR V, has a non-removable battery. Despite that above sentence perhaps leading in a different direction, I was perfectly happy with the battery life of the RAZR V. It's slightly smaller than the Droid RAZR at 1750 mAh, which generally speaking I found to have perfectly adequate battery life for me; in turn, this meant that the RAZR V also had adequate battery life. 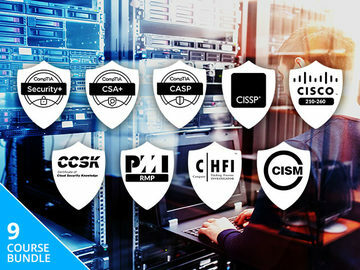 I've tested a few TI OMAP-based devices in my time at Neowin and there seems to be a common theme among them that, as long as you are connected to Wi-Fi, the device can last for an exceptionally long time. Connected to HSPA sure, the battery life is around a day of moderate use, but just sitting in my house connected to my 802.11n network and I can easily get two days of usage, and astonishingly more than a week in airplane mode. 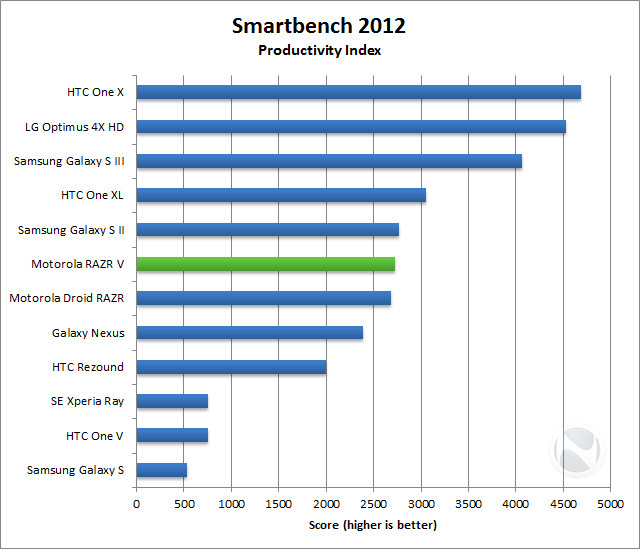 With intense usage the RAZR V gets rather warm, but still manages to last the standard 6-8 hours that I would expect. It's not exactly a device made for gaming, but if you feel like a break from your work to blast enemies in Shadowgun, it's not going to force a charge before the day is over. Below you can see how the RAZR V performs in my battery life test, which involves playing a 720p movie on repeat, at 75% display brightness in airplane mode, until the battery gives way. 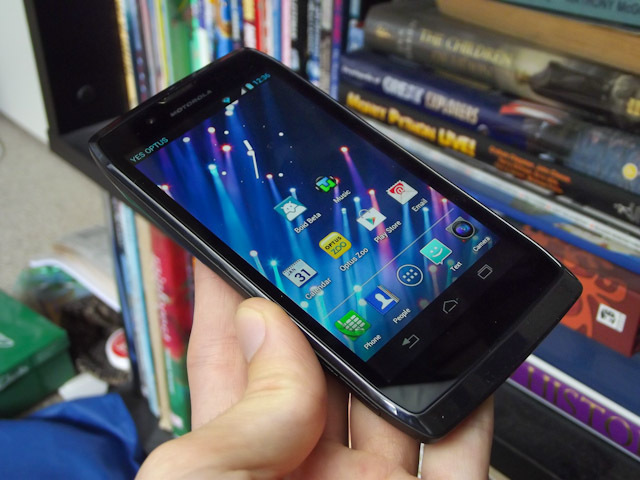 As a mid-range smartphone, the Motorola RAZR V is perfectly okay. The design is reasonable, and although it's not as good as the Droid RAZR, by itself the only lasting complaint is the power button. The camera and display are alright without being amazing, and the dual-core TI OMAP processor is a modest chip that does everything it needs to in this type of device. I do have to take the time to specially praise the software combination on the RAZR V. While Optus has spammed it up a little bit, the ICS-style present across most of the apps is exactly what I like to see, and it's complemented by the great Smart Actions app which you'll find yourself using quite a lot. The problem is that in a competitive market, "okay" just doesn't really cut it. 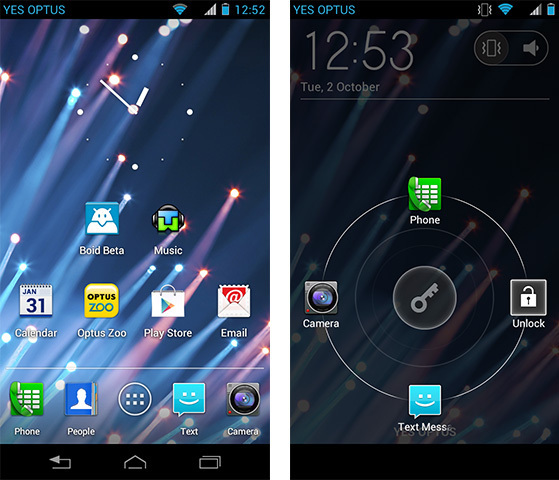 The RAZR V is available on Optus' $35 per month plan plus $4 p/m for the handset ($39 p/m total over 24 months); but you can get the HTC One S for $41 p/m all up, and it's a much better mid-range phone. 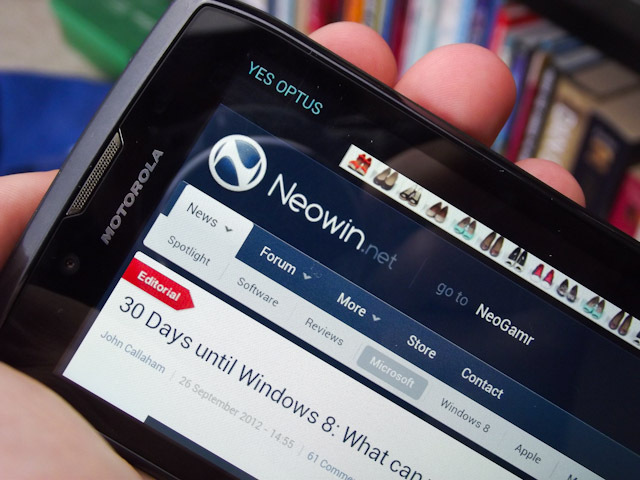 New Windows Phones are also just around the corner, with the Nokia Lumia 820 and HTC 8S bound to be competing as well. To make matters worse you can purchase the GSM Motorola RAZR outright for just $389, and then go on Optus' $19 p/m BYO-phone plan (essentially equivalent to the $35 RAZR V plan), making the total 24 month cost $617 rather than $936. This is a far better deal that comes with a better phone, and even if you choose the $34 p/m BYO-phone plan - a plan with more "included value" than the $35 RAZR V plan - it still comes up cheaper by nearly $150 over 24 months. So we're left with an okay phone with not-okay value - a proposition that makes it incredibly hard for me to give it a recommendation.